This example shows how to measure the packet error rate of an IEEE® 802.11ac™ VHT link using an end-to-end simulation with a fading TGac channel model and additive white Gaussian noise. This example also demonstrates how a parfor loop can be used instead of the for loop when simulating each SNR point to speed up a simulation. parfor, as part of the Parallel Computing Toolbox™, executes processing for each SNR in parallel to reduce the total simulation time. An 802.11ac VHT transmission is simulated in this example. A VHT format configuration object contains the format specific configuration of the transmission. The object is created using the wlanVHTConfig function. The properties of the object contain the configuration. In this example the object is configured for a 80 MHz channel bandwidth, 8 transmit antennas, 8 space-time streams, no space time block coding and 256-QAM rate-5/6 (MCS 9). In this example a TGac N-LOS channel model is used with delay profile Model-D. For Model-D when the distance between transmitter and receiver is greater than or equal to 10 meters, the model is NLOS. This is described further in wlanTGacChannel. An 8x8 MIMO channel is simulated in this example therefore 8 receive antennas are specified. For each SNR point in the vector snr a number of packets are generated, passed through a channel and demodulated to determine the packet error rate. maxNumErrors is the maximum number of packet errors simulated at each SNR point. When the number of packet errors reaches this limit, the simulation at this SNR point is complete. maxNumPackets is the maximum number of packets simulated at each SNR point and limits the length of the simulation if the packet error limit is not reached. The numbers chosen in this example will lead to a very short simulation. For meaningful results we recommend increasing the numbers. Set the remaining variables for the simulation. For each SNR point a number of packets are tested and the packet error rate calculated. A PSDU is created and encoded to create a single packet waveform. The waveform is passed through a different realization of the TGac channel model. 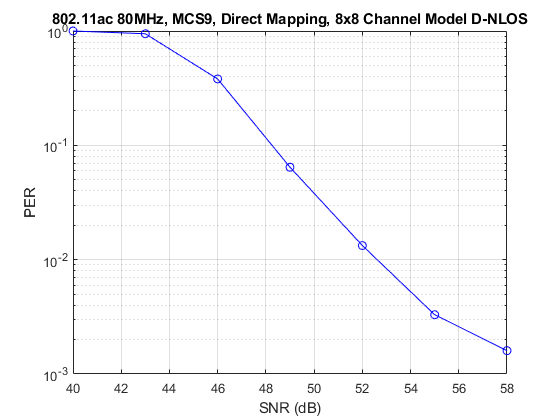 AWGN is added to the received waveform to create the desired average SNR per subcarrier after OFDM demodulation. comm.AWGNChannel is configured to provide the correct SNR. The configuration accounts for normalization within the channel by the number of receive antennas, and the noise energy in unused subcarriers which are removed during OFDM demodulation. Coarse carrier frequency offset is estimated and corrected. Fine timing synchronization is established. The L-STF, L-LTF and L-SIG samples are provided for fine timing to allow for packet detection at the start or end of the L-STF. 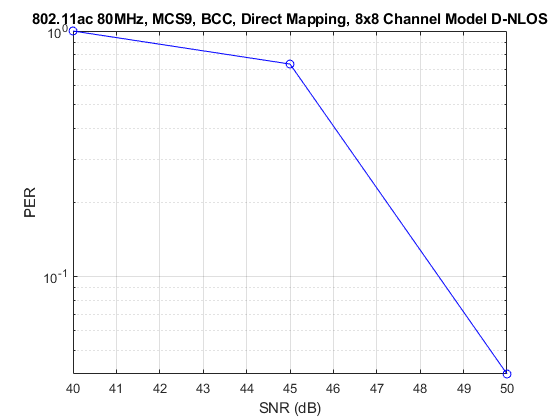 Fine carrier frequency offset is estimated and corrected. The VHT-LTF is extracted from the synchronized received waveform. The VHT-LTF is OFDM demodulated and channel estimation is performed. The VHT Data field is extracted from the synchronized received waveform. The PSDU is recovered using the extracted field and the channel estimate. A parfor loop can be used to parallelize processing of the SNR points, therefore for each SNR point an AWGN channel is created and configured with comm.AWGNChannel. To enable the use of parallel computing for increased speed comment out the 'for' statement and uncomment the 'parfor' statement below. The number of packets tested at each SNR point is controlled by two parameters; maxNumErrors and maxNumPackets. For meaningful results it is recommend that these values should be larger than those presented in this example. Increasing the number of packets simulated allows the PER under different scenarios to be compared. Try changing the transmission and reception configurations and compare the packet error rate. As an example, the figure below was created by running the example for maxNumErrors: 1000 and maxNumPackets: 10000.